Ballet versus Ballroom Training Approach | JC Dance Co.
As a ballroom dance instructor and a ballroom dancer myself, I feel very frustrated seeing the approach of learning how to dance focused solely on choreography. If you really want to be a skilled dancer, whether social or competitive, you need to shift your learning approach to one that is actually going to improve how you dance, not just expand your knowledge of what to dance. In comparing ballet and ballroom, the original goal of pursuing either endeavour is often completely different. Ballroom dancing starts out for pretty much everyone (except perhaps kids) as a social activity. People learn how to dance with a partner and often their goal is to meet people and have fun. When people take a ballet class, the primary goal is not to meet people; it’s to improve posture and balance; and perhaps to explore expression and musicality. The focus of ballet dancers is more on the improvement of individual technique, not on learning choreography in order to move across the floor with a partner. So my question is: If we want to be more technically sound and excel at our craft, why don’t we ballroom dancers use some of the training methods that ballet dancers have? In every ballet class, whether it be for kids, adults, amateurs or professionals alike, a large portion of the class is dedicated to barre work. What is the image that you see when you think of a ballet class? You see dancers at the barre working on their foot positions, posture, and all of the basic actions of ballet such as plies, tendus, etc. 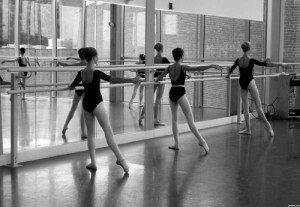 The exercises performed by the barre are essential to building a strong foundation, and to allow dancers to do the movements required in their more complex choreography. Ballroom dancers should be doing the same. We should be doing ‘barre work’: individual exercises that work on our skills and prepare our bodies to dance the choreography together. We need to practice the basic actions on our own before we even start moving across the floor. Just as for ballet dancers, these exercises need to be repeated on a consistent basis with accuracy and precision. If you are one of those couples who just jump into choreography right away every time you practice, consider changing your learning approach. Do the proper exercises or ‘barre work’ needed to excel at ballroom dancing; do it with supervision, so that you learn what is right and wrong. At the same time, focus your energy into developing a strong body awareness of your own, so that you yourself can sense the motion, weight and position of the body through each movement; and therefore improve your individual technique. Starting Sept 3, a new ‘Ballroom Barre Work’ section will be incorporated into our PEAK training sessions. Similar to a ballet class, where the teacher roves around the room, calling out corrections to each of the students, we will be going around and checking your alignment, posture and energy. Just as ballet dancers do, we will be doing ‘Ballroom Barre Work’ individual exercises before dancing across the floor. For PEAK, we have carefully devised a set of exercises that specifically target the building blocks of ballroom dance movements. The purpose of ‘Ballroom Barre Work’ will be 2-fold: 1) warm-up and 2) improve overall technique. Come and join us to make sure that you are using the right approach to learning!